Thank you so much to all those that made this year’s IGNITE Conference a huge success! We were delighted to have such an amazing range of international experts and participants present. We hope to see you again next year. Sir Paul Collier, CBE, former director of World Bank’s Development Research Group from 1998 to 2003, is a Professor of Economics and Public Policy at the Blavatnick School of Government at the University of Oxford. Collier is also a critically acclaimed author. His book, The Bottom Billion, identifies four traps that keep the poorest people in the world poor, and offers escape routes to improving opportunities for everyone. Mahmud is the founder & CEO of J-Palm Liberia, an palm oil processing company in Monrovia, Liberia. His company produces a range of palm oil based products using a ‘no-waste’ manufacturing process. He is also the winner of the IGNITE Research Competition 2015. His research examines income risks that small-business entrepreneurs face in Liberia and the extent to which insurance mechanisms are effective or ineffective in managing those risks. Mokhtar is the Founder & CEO of Port of Mokha Coffee, Yemen, and comes from an ancient lineage of coffee farmers. As a social historian, coffee interventionist, community organizer, Mokhtar hopes to connect the farmers of the oldest, highest-quality coffees with the world. Mokhtar is the first licensed Q grader (coffee sommelier) from Yemen and made international news when he escaped war-torn Yemen by crossing the Red Sea on a fishing boat with his coffee samples. Michel has held field positions in North Africa, the Middle East, India and more recently in Nairobi, whilst with the International Finance Corperation. Throughout Michel’s career, and in his current position as FCS Manager for Africa, he has focused on developing tailored advisory proposals to help IFC’s clients deepen relationships with the local economy, improve governance and increase compliance with IFC’s Business Standards. Dr. Obay Said Al-Dewachi is the University President of Mosul University in Iraq. Dr. Al-Dewachi holds a Master degree in Agricultural and Food marketing from the Newcastle upon Tyne University, England. Furthermore, he has a Ph.D. in Marketing from Clermont Fd. University, France. Dr. Al-Dewachi has been leading Mosul University during the past years and managed to keep the education going in alternative places because the university was taken in by the Islamic State. Wissam fled Syria and arrived in the Netherlands in 2014. Wissam has a graduated degree in fine arts – artist/painter and graphic designer. He possess 17 years’ experience as Creative Director/Art Director and TVs’ Director in advertising and marketing. Furthermore, Wissam has 8 years management experience in advertising, marketing and PR. He shares his knowledge and talents to facilitate change for newcomers in the Netherlands. Tilman is the Founder and Director of International Security and Research Center (ISDC) in Berlin and Team Leader of Development Economics at Leibniz Institute of Vegetable and Ornamental Crops (IGZ), Germany. Professor Brück is also the Co-Founder and Co-Director of the ‘Households in Conflict Network (HiCN)‘, a global research network studying the intersections of conflict and development at the micro-level. Amina is the Director of Capabel & Imko Educations. Amina has years of experience in management and started her carrier at Capabel & Imko eight years ago. Capabel language has successfully participated in over 20.000 language projects. Furthermore, Capabel initiates vocational educations with extra focus on language and training. Amina her passion lies within (language) education because it enables people to follow a path towards a better life. Eefje is a storyteller and co-founder of the journalism production company Prospektor. She is also one of the initiators of De Asielzoekmachine (The Asylum Search Engine) – a cross-media project that investigates the complex world of Dutch asylum policy and offers citizens an opportunity to participate. It consists of a series of events and meetings, exhibitions, an online documentary, a TV documentary and a three-part radio documentary. Fathi Al Mudaris is Senior Advisor of Economic Relations at the Kurdish Ministry of Trade and Industry. He holds an education in English Language and has previously worked as an English translator in KLA – A British NGO in Erbil. Fathi participates regularly in workshops where he shares his experiences. During the IGNITE Conference, he will clarify why higher education and job creation in Iraq/KRD is currently highly needed. Marc is the Regional Director for Eurasia and South Asia at the Center for International Private Enterprise (CIPE) in Washington, DC. He oversees field offices in Ukraine, Afghanistan and Pakistan, as well as projects across Eastern Europe, the Balkans, Eurasia, and South Asia. He has particular expertise in the areas of anticorruption, entrepreneurship, women’s economic empowerment, and corporate social responsibility, among others. Nataliia Zhuhai is the Program Officer at the Center for International Private Enterprise (CIPE) Representative Office in Ukraine. She possess over fifteen years of working experience in the areas of public policy, SME development, and journalism. She managed a range of technical assistance projects in Ukraine focused on small and medium-sized businesses development including those who were displaced by the conflict in the East of Ukraine. Jean-Michel is CEO of Investisseurs et Partenaires (I&P), an impact investing and private equity firm, which focuses on small and medium-sized enterprises and microfinance institutions in Africa. He now works on implementing the theories developed in his book, Africa’s Moment, which he co-authored. Jean-Michel also serves as a member of the UN General Secretary’s eminent persons’ panel on the post 2015 agenda. Valentina holds a PhD in Public Policy from the University of Chicago. She is a First Economic Affairs officer, in the Division for Conflict and Emerging issues of the United Nations Economic and Social Commission for Western Asia (UN ESCWA). Before joining ESCWA, she worked as a Consultant for UNICEF in New York and the World Bank in Washington DC. Her research focuses on the impact of conflict and displacement on development at the micro level. Fernado holds a PhD in Econometrics from the University of Geneva. He is a First Economic Affairs officer, in the Division for Conflict and Emerging issues of the United Nations Economic and Social Commission for Western Asia (UN ESCWA). He has written a number of papers quantifying the neighborhood effects of conflicts, and its policy implications. Neil is an economist specializing on topics at the interface of economic development, political instability and conflict. In 2011, he joined the German Institute for Economic Research in Berlin, working first on the EUSECON program and later, the WISIND program. In January 2012, he moved to the Stockholm International Peace Research Institute (SIPRI), where his research included development and analysis of a jobs quality index for Kyrgyzstan. Stephanie Deubler has been working for Deutsche Gesellschaft für Internationale Zusammenarbeit (GIZ) since 2009. After two years working on private sector promotion in rural areas in Cambodia, she joined the Sector Project Migration and Development at GIZ headquarters in Eschborn in 2011, where she is focusing on diaspora entrepreneurship. Since 2015 she has also been working for the GIZ Global Programme Refugees. Barthout is a Managing Partner at XSML, a frontier market fund-manager active in DR Congo, Central African Republic and Uganda. Barthout works with entrepreneurs in portfolio companies to grow and improve their businesses. Since 2011, XSML has invested in 40 small and medium sized enterprises (SMEs) in sectors including healthcare, education, retail and services, so far creating about 500 jobs and returning some 30% of capital of the first fund to investors. Alban started working as a researcher at Riinvest Institute in 2006 after spending some time in the banking sector. Since 2010, Alban holds the position of Research Director at Riinvest Institute. He also lectures economics at the university. He holds a graduate degree in economics from Prishtina University and post-graduate and doctoral degree in economics from Staffordshire University in the UK. Aki is a postdoctoral researcher at the University of Bremen. In her research activities, she focuses on various aspects of entrepreneurial activities by migrants, diaspora and refugees in transnational settings. In the previous years, she has been offering research seminars on diaspora entrepreneurship at the University of Bremen. She is also a co-organizer of the International Conference on Migration and Diaspora Entrepreneurship (MDE). Abouzkeh is Director-general of the Libya Enterprise for Small and Medium Enterprises, and is a member of the Board of Directors of the Committee on Capital Markets Authority in Libya. He worked formerly the financial advisor to the Minister of Economy in Libya. He holds a BA and MA in Accounting and a PhD in Philosophy in Accounting & Finance. Dia, holds a PhD in Nuclear Engineering, and currently works as GIZ Libya Country Representative. He oversees the support of municipalities on the migration route and supporting Libya in Economic Integration, Diversification and Sustainable Development. Dia is also Deputy Director of Alyrad SME Fund Board of Directors, Advisor to Libya Enterprise (SME authority of Libya) and a Consultant to Renewable Energy Authority of Libya. Sascha is working at Cordaid Investment Management BV (CIMBV) as Manager Responsible Investment & Social Impact. For 15 years she has worked in the international development sector, with a special focus on responsible investment and impact investment during the last 8 years. In 2008, Sascha joined Cordaid and played a leading role in formalising social performance and impact evaluation in its investments process. Dr. Ahmed Dezaye is the University President of Salahaddin University in Erbil, Irak/KRD and the former general director of Scholarship and Cultural Relations at the Ministry of Higher Education and Scientific Research. He succeeded various educations of which an awarded PHD in Chemistry in Sydney. Furthermore, Dr. Dezaye has published over 14 papers concerning subjects within education and development. Dr. Ahmed Dikhil is professor at Tikrit University in Irak/KRD and has a PHD in Public Law with a special major in Financial Law. Furthermore, he published various articles about his Financial Law and wrote two books, ‘Racial of Legal Rule in the Taxable Legislation’ and ‘Public Finance from a Legal perspective’. Ahmed will focus on his experiences of working at a university in times of conflict during the ‘Universities in the Centre of War’ workshop. Brandon Oelofse, senior trainer and course coordinator at RNTC. Brandon has worked in advertising and television for 15 years with a focus on getting audiences to adopt new behavior. He runs a Non-profit company in South Africa that uses media as a persuasive tool in adapting behavior in poverty node areas. Nasser Al Faqih is a UNDP advisor and program designer for economic recovery in crisis settings around the world. Nasser has experience in the Islamic Development Bank (IsDB) and the Palestinian Agricultural Relief Committee in the areas of agricultural revitalization, youth and women economic empowerment and entrepreneurship. Warda Dirir is the co-founder of Innovate Ventures, the leading start-up accelerator and technology fund in Somaliland and Somalia. She and her team have been running coding camps, incubator and accelerator programmes in the region for the past few years. She has an MBA from Imperial College London and over eight years’ experience working as a Project and Product Manager with blue chip clients in the UK. In 2015 Rasheed founded the Yemen Mocha Coffee for Exporting to support Yemeni farmers access business opportunities in the domestic market. Rasheed’s business brings Ismaili coffee (a type of coffee that is difficult to source) into the variety of coffee shops in Yemen’s capital, Sanaa. It was through attending SPARK’s business support programmes that Rasheed’s business vision became a reality two years ago. He now hopes to reach out to international markets. Rafat is currently a fellow of practice at the Blavatnik School of Government, University of Oxford. He previously served as the Minister of Youth and Sports in the Government of Yemen. He has also held senior positions with PricewaterhouseCoopers and IBM in Canada and has worked on international development and trade projects with organizations such as USAID and WTO. Rafat is the co-founder of Resonate! Yemen, which aims to increase youth participation in public policy. He also co-founded DeepRoot Consulting, which provides evidence-based research and advisory services to INGOs in Yemen. Tarek el-Ghyriane is one of Libya’s leading professionals supporting youth entrepreneurs in eastern Libya. As Libya Enterprise Manager of Benghazi University Incubator, he has acquired much experience and regional knowledge dealing with opportunities and challenges confronting local entrepreneurs seeking to get their businesses operational. As a Tatweer associate, Tarek also leads a solar energy project proposal competing for MIT consulting and funding. Tarek el-Ghyriane is a well-recognized member of Benghazi society with a strong political, business and social network. Heleen Cousijn is a Project Officer at Diversion, an organization that provides social innovation throughout the Netherlands. Diversion develops successful programs to encourage discussion of taboo subjects and sensitivities, particularly in educational settings. Dr. Eri Park is Assistant Professor of Psychology at University College Roosevelt. Together with Dr. Marcin Sklad, Dr. Park developed a 7 workshop teaching program for middle and high schools based on the TERRA Toolkit (a community approach to Radicalization) to tackle radicalization. Mohamed Baban has been the Chief Technology Officer at Asia Cell in Iraq for over four years. Before this, he worked as Operations Director and Regional Technical Manager at Asia Cell. Mohamed Baban holds a Bachelor degree in Electrical & Communication Engineering from the University of Technology in Baghdad. Furthermore, Mr. Baban participated in ‘Baghdad Mobile Network’ project, building the first mobile network in Baghdad. Ten years later, he participated in the ‘3G Network’, building the first 3G network in Iraq. Dr. Thomas Hill is a clinical associate professor at the Center for Global Affairs at New York University’s School of Professional Studies, where he is director of the Initiative for Peacebuilding through Education. He oversees the peacebuilding concentration within the Master of Science in Global Affairs (MSGA) program. Dr. Hill is a peacebuilding practitioner and researcher with more than a decade of experience focusing on Iraq; since 2003, he and has made more than 35 visits to Iraq and has overseen design, development and implementation of a series of inter-related research and educational projects focused on increasing levels of peacefulness in Iraq. Dr. David Connolly is Head of Research at The Hague Institute for Global Justice. He oversees a wide range of policy-relevant research projects, and specializes in the local governance of war-torn contexts. Dr. Connolly is a specialist in local governance and has extensive experience working with the United Nations and other entities on education, urban security, and political reform in preventing violence and reconstruction after conflict. He has worked extensively in Africa, the Middle East and Central and South East Asia. Ayman Tabbaa is a founding member and Chairman of the Board of Directors of the Syrian Economic Forum. Mr. Tabbaa is a businessman was based in Damascus, Syria, where he owned a property development company. Mr. Tabbaa received his bachelor’s degree in business administration in the United States. Prior to owning his property development company, he managed several finance and property development companies. He has spent time living in the United States and Dubai. Agnese is a Researcher at The Hague Institute for Global Justice. She is involved in a number of projects looking primarily at the role of education in conflict prevention and peacebuilding, urban violence and local governance. She also specializes in economic sanctions and Iran-U.S. relations. Agnese previously worked at the Secretariat of the Knowledge Platform Security Rule of Law as Project Officer and Researcher. Farooq is the Executive Director of Al Fakhoora, a programme of Education Above All in Doha, Qatar, which works with partners to offer access to higher education for marginalised youth by providing comprehensive scholarship and empowerment programmes, including leadership development and psychosocial services. They are also involved in the reconstruction and rehabilitation of the education sector in Gaza. Mr. Burney has over 15 years of experience in the NGO sector. Dr. Fady Yarak has been the Director General of Education at the Lebanese Ministry of Education since 2007. He has vast experience in the field of social and economic development, particularly relating to education, health and social services. Corita Johannes is programme assistant, web editor and member of VAW campaign team at CNV Internationaal. Her work is centered on strengthening social dialogue, improving labour rights in supply chains and increasing youth employability. One of the major subjects within the labour rights theme is the issue of ending violence against women on the workfloor. Nada Charara is an Assistant Director for Development at the American University of Beirut (AUB). She works closely with various faculties and centers across the university, and helps in building partnerships with alumni, community leaders, institutions, and donors, who share AUB’s mission of creating leaders through transformative education, and creating opportunities for communities across the Middle East. She is involved in several projects related to higher education for refugees, and is a member of the AUB for Refugees committee focusing on outreach and innovative holistic approaches to support education, entrepreneurship, protection, and health services for refugees and marginalized communities. As General Manager of The Libyan Programme for Reintegration and Development at SESRIC. Mustafa has overseen the establishment, management and execution of Libya’s ex-combatant reintegration programmes, which has served over 162,000 beneficiaries to date. Mustafa has twenty years experience of entrepreneurship in the IT sector and four years of experience in politics, public management, social services management and SME’s development. Kurdo Mohamed fled on age of five from Kurdistan to the Netherlands. 25 years later, Kurdo is an experienced advisor in entrepreneurship. He practices this within Eigen Werk at Municipality of Amsterdam as an expert, guiding refugees who are interested in starting an enterprise. In the past, he has been active in various projects in multiple municipalities in the Netherlands. Prof Dr. Coskun is the rector of Gaziantep University since 2008. He pioneered the development of the university and quadrupled it in all areas like physical facilities, student number, quality assessment etc. Dr. Coskun put his signature under great successes and advancements like social integration, essential breakthroughs on education, internationalisation, cooperation between University and Industry, R&D and innovation. Imke Greven is Coordinator of the Behind the Brands project, a campaign by Oxfam Novib International. She holds a Masters in Development Economics at Wageningen University and joined Oxfam Novib in 2014. Her work is focused on private sector influencing, through engagement and campaigning, for sustainability in value chains. In 2012, Nassira Boudhan the entrepreneur behind FFORE, quit her job as marketing manager at an international bank so she could focus her career on long-term empowerment of women & girls. Nassira was born in a small village in Northern Morocco, where education for women & girls was not a priority. Today she is helping to support the self-reliance of women and girls. Most of these women and girls work in the textile & garment industry and never had the chance to go to school. Ahmed Altaleb is a second year Civil Engineering student at Gaziantep University, Turkey. When the war started, Amhed was studying at Aleppo University, and had to drop out. Due to the hardships he endured, it took him four years to get back to studying. In 2015, he was awarded with a SPARK Scholarship and started studying again in Turkey. Ahmed chose to study civil engineering because he believes that this will give him the chance to reconstruct Syria soon after the war ends. Thomas Loudon is the CEO and co-founder of VJ Movement and Cartoon Movement, both organizations that pioneer in online journalism. The beating heart of these media platforms is a global network of professional journalists, who work in line with the company’s motto “There is more than one truth’. Previously Loudon served as Middle East correspondent working as a video journalist, but also contributing to radio, online and print-media in four different languages. He was the first Dutch journalist to be based in Iran after the revolution. Mustafa Othman is the co-founder and manager at Shaqodoon Organization a local organization based in Somalia/land. He has extensive technical and management experience in the youth employment, entrepreneurship, education and mobile technology for development. Mosul University and Tikrit University, both in Iraq, have faced many challenges in recent years. With the arrival of the Islamic State both institutions were shut down, but managed to continue educating their students in alternate locations away from their occupied campuses. Tikrit University is almost a year into its post-IS experience, whereas students from Mosul University are still waiting for a chance to return. How to rebuild a university after war? How to address the needs of students after their return? What can we learn from Tikrit first year after IS? Diaspora entrepreneurship has only recently become a topic of interest in the academic and development world. For a long time, diaspora engagement was not generally valued and often neglected. Over time, the diaspora communities have shown how much they can contribute to the development of their countries of origin. The question that we need to ask ourselves now is; how can we best support diaspora entrepreneurs and innovators to reach their full potential? This workshop will explore the obstacles diaspora entrepreneurs face when starting businesses, and discuss the best ways to tackle these issues. Many newcomers in the Netherlands struggle to find suitable work. The rates of unemployment for refugees is high: only about 30% of ‘permit holders’ have a fulltime job. Many are working (far) below their level of education and skills. What solutions are there and how do we really make them happen? 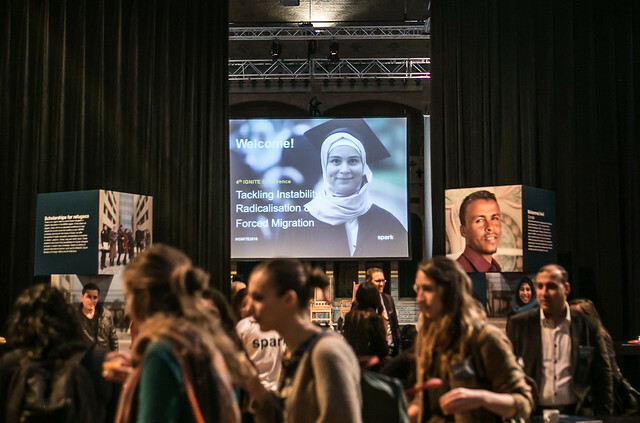 In a 90 minute interactive workshop, creative entrepreneurs, Wissam Hema and Eefje Blankevoort (The Asylum Search Engine), alongside Gemeente Amsterdam and Calder, as well as other participants, will find the solutions. Entrepreneurs from Somalia, Libya, Liberia and Syria offer new insights about doing business in fragile states. During an interactive masterclass, the entrepreneurs will share their personal experiences of becoming business-owners and describe what entrepreneurship means for their country. Obstacles such as corruption, slow government and lack of competition or capital can have a major influence on the future of businesses. The masterclass will demonstrate the struggles faced by entrepreneurs and will deliver solutions. The entrepreneurs will explain their motivation for starting their business, and how they hope to contribute to development in their countries. The theme of this workshop is to highlight the subtle ‘little things’ in which a holistic scholarship programme sorts out to ensure each applicant has the best opportunity to move from pre-scholarship, in-scholarship and post scholarship stages. First part of the workshop: the journey of the obvious challenges of the refugee accessing higher education by the audience. The second part: the subtle nuances shared by Syrian students. This shows how critical it is to back up each student with a holistic scholarship programme that advocates for each applicant to ensure they are able to mitigate what may seem like ‘the little things’ but are perilous for a refugee. Having a high share of unemployed young men in urban areas is considered a key risk factor for the outbreak of violent conflict. The MENA region has a large and growing share of unemployed young people who are facing uncertain economic prospects. The promotion of employment is hence considered a key tool to strengthen peace and stability in the MENA region. This session will review if these assumptions are valid, what evidence we have on this issue and what next steps are needed from governments, donors and civil society. The speakers will draw on ongoing and recently completed research conducted in Afghanistan, Iraq, Lebanon and Yemen and other countries. Recent studies suggest that access to education reduces the risk of radicalisation towards violent extremism. This interactive workshop investigates links between education, employment and violent extremism. Key questions include: what role can education play in preventing violent extremism? Is the lack of qualified jobs an incentive for educated people to become a violent extremist? Are development or security approaches to prevention most effective? Can these approaches be complementary, or do they obstruct one another? Using what they have learned, participants will search for solutions together. Libya’s descent into civil war after the revolution has been well-chronicled. So too, has Libya’s role in the mass-migration of millions of refugees risking their lives to get to Europe. However, there are now many initiatives attempting to rebuild the fragile state through entrepreneurship development and employment creation. This workshop will focus on the role of the government in the reconstruction of private sector development, how SME’s are being supported and how the government is tapping into the economic potential of migrants. Participants of the workshop will also hear from a Libyan entrepreneur from Benghazi and the personal obstacles faced in starting a business surrounded by on-going conflict. This masterclass promises a fully immersive lesson in Yemeni coffee from the charismatic, 27 year old Yemeni American, Mokhtar Al Khanshali. Port of Mokha is the coffee company founded by Al Khanshali in order to empower Yemen’s coffee farmers to bring specialty grade cofee to the world. Port of Mokha works to educate on best agricultural practices, employ local people, implement quality control standards, and remain transparent, so that the coffee can be traced from bean to cup. Come and enjoy yours whilst Al Khanshali discusses how he does business in the midst of ongoing conflict, and what keeps him going in the face of such adversity. During and after conflict, international support focuses on humanitarian needs, but insufficient attention is often paid to how conflict affects the private sector, and the role of the private sector in recovery. In Kosovo in the 1990s, the Riinvest Institute worked with civil society and business to strengthen post-conflict governance. Currently, the Syrian Economic Forum is laying the foundation for eventual recovery through policy research and advocacy. In Ukraine, the Center for International Private Enterprise is supporting entrepreneurs to spur recovery in conflict-affected areas. This panel will explore how post-conflict, economic revival through private sector development can spur the inclusive growth that is needed for long-run stability. Kurdistan Region of Iraq has to deal with major challenges regarding 2,2 million IDPs and refugees (40% of the KRG population), ISIS war, and financial conflict. The Kurdish universities were able to make place for thousands of IDP and refugee students, while the universities cannot pay the salaries of the professors. In this workshop the rector of Salahaddin University (Erbil) and the advisor to Minister of Trade and Industry share their recent experiences and the measures taken to tackle these challenges. ‘Strengthening the private sector and promoting entrepreneurship’ is one of them. Three out of five fragile or conflict-affect states (FCS) tend to fall back into crisis within five years after the end of a violent conflict. What should we do differently to increase investment in African FCS to contribute to sustainable economic and social development of fragile states that will eventually contribute to stability? This workshop will feature a debate on ways to effectively promote sustainable investment in FCS, as a means to respond to fragility, and its expected contribution towards these countries’ development agendas. The session will put forward a few ideas and seek diverse views from panelists. Nowadays, the internet is a frequently used instrument for radicalisation all over the world. Political extremists and terrorists use the power of this medium to reach out to young people. The internet has ensured that organisations can easily get in contact with vulnerable people. This workshop will focus on the huge concern of the influence of online radicalisation and the methods to counteract against this instrument. What is the role of education in rebuilding war-torn Syria? This workshop zooms in on restoring the ties between the universities of Aleppo and Gaziantep. Before the war, there used to be lively collaborations. Now, the renowned Aleppo-Gaziantep Agreement needs to be revived. Three issues are crucial in supporting education in Syria: quality, recognition of degrees, and financial support. That also counts for another challenge ahead: rebuilding the University of Raqqa. How to go about that? Yemen’s ‘forgotten war’ has led to the deterioration of all aspects of life. This state of emergency has influenced a shift from development focused work to emergency, humanitarian relief. With young people representing more than 50% of Yemen’s population, employment, self-sustenance and income sources are lacking. Is humanitarian assistance all that Yemen needs? What about development assistance? A Yemeni entrepreneur, former politician and local youth organisation will use this workshop to explore what the true price of abandoning entrepreneurial development in Yemen could be. Several studies show that investing in women and gender equality is the right and smart thing to do. Removing the obstacles of women and girls obtaining an education, having access to safe healthcare, living lives free from violence, and overcoming discrimination are fundamental keys to solving some of the world’s greatest problems including poverty. In this session WO=MEN Dutch Gender Platform and the guest speakers explore the benefits and challenges of gender within social enterprises. After his keynote in de Grote Zaal, Paul Collier dives deeper into issues related to the present refugee crisis. He focuses on restoring normal life during refuge and accelerating a post-conflict economic recovery that helps to stabilise a peace. It was an absolute pleasure to be included in the IGNITE Conference. Truly a wealth of information that has placed me in a position to join hands in the support of entrepreneurs in regions of such fragility and pain. SPARK and IGNITE are always an inspiration to us working in conflict and hard environments. Seeing and listening to others that are struggling and striving to make the positive change is inspiring and “Igniting”! IGNITE brought together a fascinating group of people all interested in how entrepreneurs and job creating can help build peace and stability. The presentations were inspiring, the discussions stimulating and the exchanges outside the meetings rooms very helpful. As someone who has recently started working with young entrepreneurs in Somalia, the IGNITE conference has been a great platform to learn about what other organisations working in similar environments are doing to overcome the challenges of working in fragile regions. It was a valuable opportunity to meet people from many different nations and to know their efforts to overcome the local problems. The discussions during IGNITE were organised in a good manner, it is definitely perfect work! IGNITE 2016 offered diverse presentations and workshops by various actors such as researchers, NGOs and entrepreneurs. It is such a great platform for all the stakeholders with different backgrounds to co-create solutions for the challenges post-conflict states are facing. I’ve rarely found myself surrounded by so many constructive actors all focused on finding and implementing sustainable and practical steps to address problems caused by radicalisation and forced migration in pursuit of more peaceful societies. What a hopeful day IGNITE 2016 was. Educators and entrepreneurs from many countries told their stories about resilience and insights on how to move forward even in the most difficult circumstances during or after conflict. IGNITE always brings together diverse groups of people and their innovative ideas. IGNITE 2016 was no exception. It is our privilege to partner with SPARK! I think that IGNITE 2016 is the best scientific event I attend up to now. Speakers from different types of states and sciences discussed the problems of the world together. More than anything, the event was exciting and optimistic, despite the serious topics at hand. Too often, I see pessimism infiltrate such serious discussions. Not here. And that was refreshing.